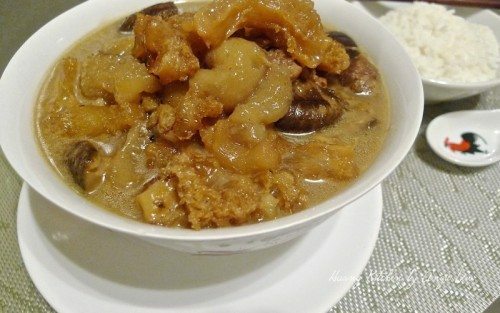 Braised Sea Cucumber With Fish Maw (焖海参花胶) is a very simple dish that every Chinese family can relate and enjoy. It is not only flavourful but also has high nutritional value. Sea cucumber with its gelatinous texture is a delicacy in Chinese cuisines. It is believed to help to prevent aging. Fish maw and pork tendons, on the other hand are a good source of collagen as they improve blood circulation, complexion and heal wound after an operation. A perfect dish anytime … especially so during the festive new year. This is s very simple dish that every Chinese family can relate and enjoy. It is not only flavourful but also has high nutritional value. Sea cucumber with its gelatinous texture is a delicacy in Chinese cuisines. It is believed to help to prevent from aging. Fish maw and pork tendons, on the other hand are a good source of collagen as it improves blood circulation, complexion and heals wound after an operation. A perfect dish ... especially for the festive new year dinner. First heat up some oil in wok. Stir fry sea cucumber and spring onion, for about 3 minutes. Then set aside the sea cucumber for later use. In the same wok, fry the dried shrimp till fragrant and golden brown in colour. Then add in shitake mushrooms. Fry for a few minutes. Next add in the marinated chunks of pork. Give a stir to mix everything together. Add in the soaked pork tendon and fish maw. Then add in soy sauce. Also some salt. Stir till mixture is well mixed. Then add in hot water. Add some dark caramel sauce for colour. And a few drops of sesame oil for flavour. Cover and allow to simmer ( low heat ) for 5 minutes. Then transfer all the mixture to a pressure cooker. Lastly, add in the sea cucumber. Cook in pressure cooker until done. Alternatively, allow all the ingredients including the sea cucumber to simmer in a pot for 45 minutes over medium-low heat. And we're done! The fish maw is braised over low heat to give it a slight chewy texture. The tender sea cucumber soaks up all the flavourful braising sauce. The pork tendon is soft such that it almost melt in your mouth. Serve immediately with steamed rice. The braising sauce is SO good over rice that you may not have enough of it. SO .. ENJOY! 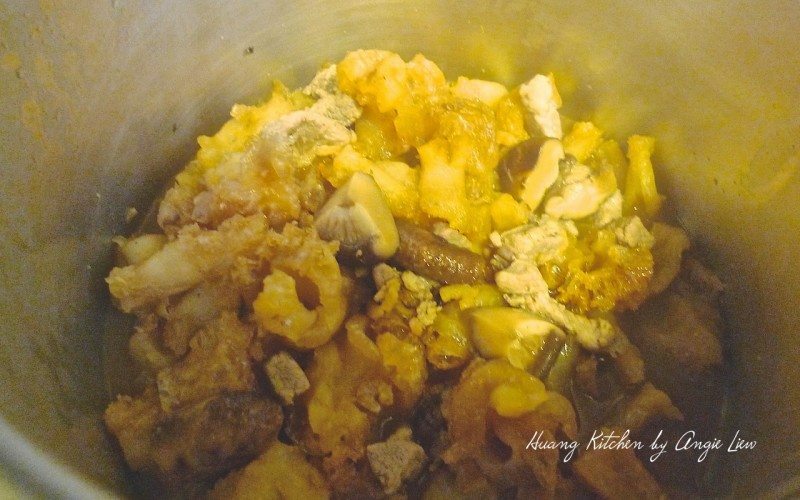 Do not overcook the dish, otherwise the sea cucumber, fish maw and pork tendons will become too soft and mushy.